The Office of Public Health Practice (OPHP) is dedicated to assuring a competent public health workforce through professional education and training opportunities. Professional education and training is a continuous improvement process lasting from the time an individual decides to enter education until retirement. Knowledge and skill requirements are continuously changing for public health practitioners. The OPHP is committed to offering education and training opportunities to meet the needs of current public health workforce. If you would like to request a training or have questions about upcoming training please contact Katie Brandert. 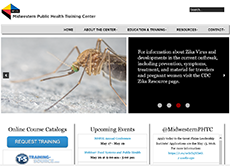 “What is the Midwestern Public Health Training Center? The Midwestern Public Health Training Center is one of ten regional public health training centers funded by the Health Resources and Services Administration (HRSA), an agency within the U.S. Department of Health and Human Services. MPHTC covers federal Region VII, which includes Missouri, Iowa, Nebraska and Kansas. The Center is housed at the University of Iowa, with the UNMC COPH serving as a local performance site. How can you benefit from the Training Center?